Red Iron Oxide is a unique natural red hematite produced through beatification & fine grinding of our exclusive domestic ore body. Red Iron Oxide- hematite is light-fast, chemically stable & color controlled within narrowly defined parameters. This product may be used Paints, Roofing Tiles, Asphalt, Concrete Products, Sand Lime Bricks, Paper And Cardboard, Plastic, Rubber Products, Artificial Leather, Wood Stain Floor And Shoe Polish, Cattle And Poultry Feed, Fertilizers, Glass, Ceramics in as well as many other applications requiring a cost effective, easily dispersed Natural Red Iron Oxide. We are Manufacturers of specialty high quality Iron Oxides for use in various applications. Our range of Iron Oxides including natural iron oxides, red iron oxides are produced using high quality of raw material with maximum purity up-to 99%. We have the advantage of having exclusive access to these high quality materials and coupled with our superior manufacturing and laboratory facilities produce material as per any international producer worldwide. It is the Iron III Oxide known as ferric oxide (Fe2O3) Red Iron Oxide powder is the naturally occuring mineral also called as Hematite. Red Iron Oxide powder is the primary iron source for the steel industries. Red Iron Oxide powder is ferromagnetic in nature having dark red colour. In order to Fulfill the ever changing demands of our clients, we have been engaged in manufacturing, supplying and exporting superior quality Red Iron Oxide Powder. 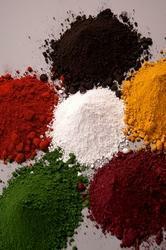 In compliance with international quality standards, the offered powder is ideal to be used as a pigment. Moreover, this powder is commonly known as super hematite. Besides, we customize these products as per clients' requirements. Ferric Oxide (Fe2O3) 90% min. Shlok Enterprise offers Red Oxide of superior quality. Red Oxide is most widely occurring in nature. Red Oxide is the basic mineral for steel plant. 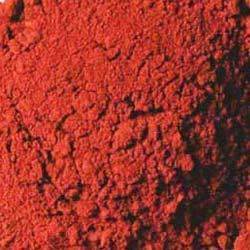 Red Oxide has tremendous application in building, construction, paint and many other industries. Red Oxide is known for its corrosion protection, inertness to alkali and chemical. Inertness to alkali and chemicals. 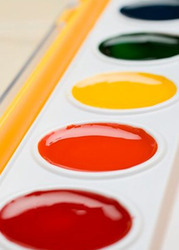 Durability of paint made with Red Oxide is very well known. We are the manufacturers of various kinds of high quality Iron Oxide for paints. 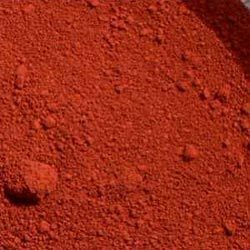 Looking for Red Iron Oxide Powder ?